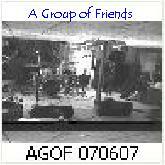 Check out these official AGOF (A Group Of Friends) Releases. See end for Legend. dj-g-v dJango Mulholland came by to record some thracks, I liked this one, but thought he wrote it, he did not, oops. n-d was Norm Thorne on drums, he also played guitar before loosing track of him and I stopped trying 7 times ago. Charles is banned for life! Willie played drums very loudly, got a T-Shirt and we've never seen him since.